An open source, AJAX implementation of the VirtualBox user interface written in PHP. 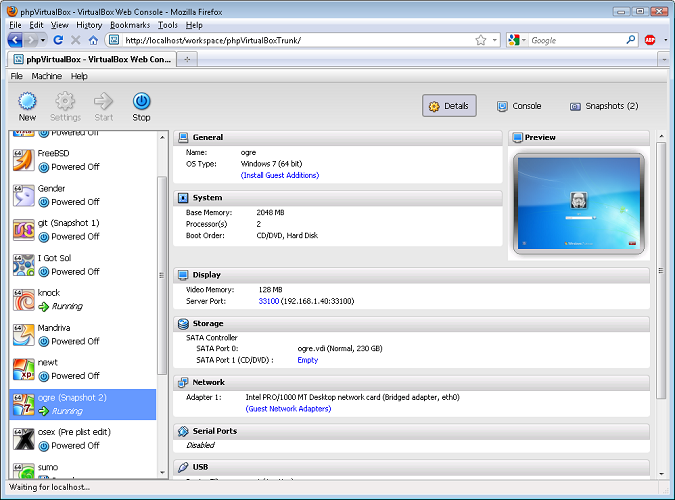 As a modern web interface, it allows you to access and control remote VirtualBoxinstances. Much of its verbage and some of its code is based on the (inactive) vboxweb project. phpVirtualBox was created for people (like me) who prefer not to have to log in to their headless VirtualBox host to administer their virtual machines. “I develop and support phpVirtualBox in my spare time – free of charge. I do not receive payments from VirtualBox (Oracle) nor am I affiliated with them in any way. If you find this program useful, I ask that you please donate here.” – the written said. Other web browsers may work, but are simply untested. Please see the Installation wiki page for instructions on obtaining and installing phpVirtualBox. No user responded in " PhpVirtualbox – A web interface to Manage remote Virtualbox VMs "